I’ve had a heck of a month so far- lots of interesting photoshoots and lovely people that I can’t wait to tell you all about. So far this week, I’ve been a Maenad, a mermaid, Scheherazade (my favourite character- I’ll tell you all about her one day), a ponygirl, and a dancing Renaissance lady. The latter has already made it onto the front page of Purpleport! Photo by Aesir Rey (who is wonderfully geeky and has excellent taste in gingerbread penguins). I’m back in Holland next month to walk in a fashion show for the beautiful Ardita Fetish Fashion, which reminded me I haven’t yet posted Ben Ernst‘s photographs of me from my last visit! We shot on this fantastic scaffolding setup, which was actually pretty high from the ground! I have, of course, saved my biggest news until last. for any of you who have not read my recent interview in Cloud Orchid magazine… I HAVE A PLACE OF MY OWN!!! There is a twist, of course- you can find out what it is if you read the interview. 😉 All I’ll say here is I have put my deposit down and if all goes fine, I’ll be living there by the end of March! 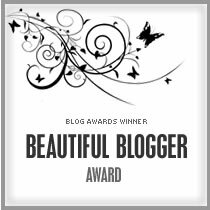 I woke up this morning rather dejected (as I expected to be) as I’m making a lot of big changes in my life (more will be revealed in August when things have been finalised/decided on) and I have to say it helped a lot opening my laptop to see I’ve been given a “beautiful blogger” award! It’s like a game of internet tag and there are rules! 1) Acknowledge the person who nominated you- so, thankyou so very very much, Chwennyland.com! 3) Nominate seven other people for the award! 2) I hate looking at pollarded trees- I think that they look mutilated! 6) My submissive side has a “thing” for Cal Lightman. (Tim Roth’s character in Lie To Me). All my other sides are making fun of my submissive side for this. 7) I don’t take drugs and with the exception of an amaretto or Bailey’s coffee once in a blue moon, I’m teetotal as well. 1) Ella Rose is a fellow writer and model. She’s been kind enough to let me read her novel and I love the description and sensuality in her writing. Even her blogs sound beautiful in a way I can never manage!! 3) Elyse Sewell was a contestant on the first series of America’s Next Top Model (before it got so formulaic). She was a hyper-intelligent medical student and became instantly successful in Asia, and her “Lost in Translation”-style blog is wonderfully bemused and sardonic at the same time. 4) La Carmina is a Japanese fashion/culture blogger with the most adorable cat ever to walk the planet. She inspires me as she follows many career paths in the same way I do, which gives me hope that I can continue doing so. 5) Three Beautiful Things. This lady records three things that have made her happy every single day. It really has inspired me to remember the beautiful things I see. Sadly, since she’s had a baby, the vast majority of the posts have become BABYBABYBABY but the spirit is still there. 6) The Ark in Space is a blog all about the fantastic, weird and unusual creatures you can find in the world. As I’m a huge nature fan and love expanding my knowledge of the natural world, this blog never stops making me smile. 7) The Lingerie Addict– as I am a huge fan of lingerie and not a standard size, I love looking here for tips on finding lingerie that will fit me, and also just seeing pretty pictures of the stuff that won’t… but is just so pretty! Can’t remember if I’ve shown you these backstage shots from a vintage lingerie shoot yet, but as they are happy pictures, here you go!